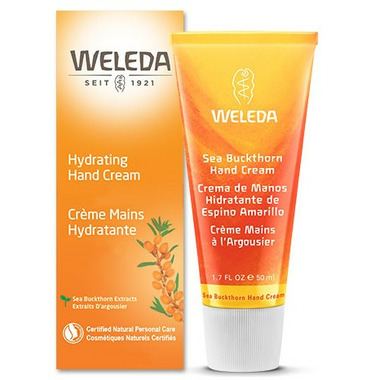 Weleda Hydrating Hand Cream is a quickly-absorbed hand cream for everyday use. This cream moisturizes your hands with nutrient-abundant oils and a fruity-fresh fragrance. Precious sea buckthorn oil was historically used to renew and repair skin. We add light sesame oil to keep the mix easily-absorbed, and we’ve chosen the revitalizing fragrance blend of lively grapefruit, fruity-sweet mandarin and precious sandalwood essential oils. Your rough hands are moisturized and become beautifully soft, smooth and supple. It’s perfect for your hands, however rough, chapped or dry. Directions: Use Sea Buckthorn Hand Cream daily. Apply a small amount to the hands and massage until completely absorbed. Ingredients: Water (Aqua), Sesamum Indicum (Sesame) Seed Oil, Alcohol, Hydrolyzed Beeswax, Tapioca Starch, Lysolecithin, Beeswax (Cera Flava), Glyceryl Stearate SE, Hippophae Rhamnoides (Sea Buckthorn) Oil, Xanthan Gum, Fragrance (Parfum)*, Limonene*, Linalool*, Benzyl Benzoate*, Benzyl Salicylate*, Geraniol*, Citral*. This is a good product. It's lightly-scented and spreads nicely. This lotion works well and a littl goes along way. It absorbs faster than most I have used. I was pleasantly surprised on how nice it smelled. A little goes a long way and I find it does a really good job. I will definitely purchased again. I really like this hand cream, does not leave greasy residue and smells great. Not as hydrating as other brands I used for really really chaped hands in cold winters, but otherwise, it is a really good product. Will buy again. The best hand cream I've ever used! Will buy it again. Nice product, hydrates beautifully without leaving your hands greasy or sticky. Smells divine and the size is perfect for your handbag. A tad expensive for the amount you get but the ingredients are clean and good quality. This weleda hand cream smells great with a nice light citrusy scent. It's a bit pricy but a little does go a long way and is very moisturizing without leaving my hands greasy. I love this cream. The scent is gorgeous, it's silky and light going on and it really helps my very dry hands. Very nice product. Well made, nice smell, spreads nicely with no residue. The only reason I didn't give it 5 stars is that the bottle is so small for the price! I've been searching for a good hand cream that doesn't leave my skin greasy. This is it. Expensive, but worth it. And it smells amazing. It is very light, absorbs fast and has an amazing scent. All my relatives loved it. I bought it as a present for my mother and mother in law.